If you are a fan of action films and particularly the first Equalizer - or you just like Denzel Washington – then this purchase was tailor-made for you. It is a well-known fact in Hollywood that Denzel Washington (Fences) never reprises a role or makes a sequel to any of his films so it was a big surprise when it was announced he would be returning as Robert McCall for the second installment of The Equalizer. The beloved, yet quirky, character from the 2014 movie was destined to be back as there was still so much to tell about him and the world from which he came. Of course, it never could have been made if Washington hadn't signed on so fans of the original were excited when he agreed and were anxious to see what was to come. This summer we got the answer and just in time for the holidays, we get the 4K version for purchase. As the sequel opens McCall is a Lyft driver who also happens to be a vigilante bring justice where he sees a need. He rides on a train in the Middle East to rescue a child who has been kidnapped by her Arab father simply to spite the girl's mother. He befriends a young man, Miles (Ashton Sanders; Moonlight), to try and guide him on the right path and help him not only cultivate his art but to save miles from his own worst enemy…himself. And, of course, he remains in touch with his friend, Susan (Melissa Leo; The Fighter). It is when Susan is murdered in Brussels – investigating the murder/suicide of one of her agents- that McCall steps up his game to find out what happened and who would want Susan dead. While trying to solve the mystery McCall endures the ultimate betrayal and discovers he has to kill people he once considered friends. With no other choice, he is forced to confront the demons of his past. Obviously, this film could never have been made if Washington hadn't been interested in reprising this role. I mean the writers and producers could have created a new character to take over the reins but, let's be honest, an Equalizer film would not have been the same without him so it's a good thing he said yes. He is ever much the calm and quiet yet calculating former assassin we met in the first film. Sanders is a nice compliment to Washington offering a counterbalance to the straight-laced older gentleman. Leo, as always is terrific and she does well in this expanded part. Her connection with Washington is believable which makes you think they really are friends and thus makes him avenging her death realistic. The 4K Blu-ray video quality is sharp and clean and colors are true and deep. An example, the paint in the mural at the end of the film pops off the screen. The Dolby Atmos, in this case, is strong and compliments the video well. Every gunshot is clear and crisp and the action envelopes the viewer from all channels. The Combo pack offers a 4K disc, a Blu-ray disc, and a digital download. The extras include "Retribution Mode" with Denzel Washington and Director Antoine Fuqua, 11 Deleted & Extended Scenes, "Denzel as McCall: Round Two" Featurette and The Equalizer 2 Pop Up Trivia Track. If you were a fan of the original movie you will certainly enjoy the sequel. Director Antoine Fuqua (Training Day) once again brings his unique vision to the movie and offers action sequences that are different and jam-packed. While the more personal storyline makes the film interesting the unexplained loose ends (i.e. why the agent in Brussels and his wife were murdered) left me a little confused. However, if you are a fan of action films and particularly the first Equalizer - or you just like Denzel Washington – then this purchase was tailor-made for you. 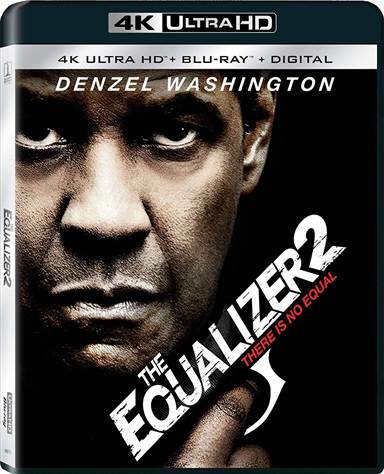 Download The Equalizer 2 from the iTunes Store in Digial HD. For more information about The Equalizer 2 visit the FlickDirect Movie Database.